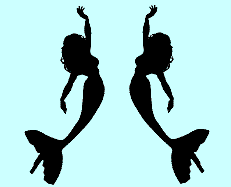 This mermaid poem and the next are by Walter De La Mare, poet and author. He wrote poems for children and adults and horror and ghost stories. H.P. Lovecraft praises his stories "Out Of The Deep" and "Seaton's Aunt" as well as his novel The Return. But there's nothing to fear in these lovely poems. Calling me, (Sam!--quietlike--(Sam! . . Morning would find me gone." "Sam" is one of my favorite mermaid poems.